For other uses, see Humber (disambiguation). The Humber /ˈhʌmbər/ is a large tidal estuary on the east coast of Northern England. It is formed at Trent Falls, Faxfleet, by the confluence of the tidal rivers Ouse and Trent. From there to the North Sea, it forms part of the boundary between the East Riding of Yorkshire on the north bank and North Lincolnshire on the south bank. Although the Humber is an estuary from the point at which it is formed, many maps show it as the River Humber. Below Trent Falls, the Humber passes the junction with the Market Weighton Canal on the north shore, the confluence of the River Ancholme on the south shore; between North Ferriby and South Ferriby and under the Humber Bridge; between Barton-upon-Humber on the south bank and Kingston upon Hull on the north bank (where the River Hull joins), then meets the North Sea between Cleethorpes on the Lincolnshire side and the long and thin headland of Spurn Head to the north. The Humber is now an estuary. When the world sea level was lower during the Ice Ages, the Humber had a long freshwater course across what was then the dry bed of the North Sea. Classical authors knew the Humber as the Abus (Ancient Greek: Ἄβος), which was one of the principal rivers, or rather estuaries in the Roman province of Maxima Caesariensis in Britain. It was reported as receiving many tributaries, and discharging itself into the German Ocean (the North Sea) south of Ocelum Promontorium (Spurn Head). Its left bank was inhabited by the Celtic tribe, whom the Romans entitled Parisi, but according to a medieval poet, no great town or city anciently stood on its banks. In the Anglo-Saxon period, the Humber was a major boundary, separating Northumbria from the southern kingdom, though at its height Northumbria did cover areas south of the Humber. 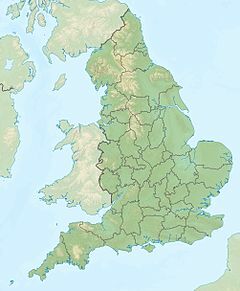 The Kingdom of Lindsey, which today is Northern Lincolnshire, was part of Northumbria before being lost to Mercia. The name Northumbria came from Anglo-Saxon Norðhymbre (plural) = "the people north of the Humber". The Humber currently forms the boundary between the East Riding of Yorkshire, to the north and North and North East Lincolnshire, to the south. In the 1719 novel Robinson Crusoe, the eponymous protagonist leaves England on a ship departing from The Humber. From 1974 to 1996, the areas now known as the East Riding of Yorkshire, North Lincolnshire and North East Lincolnshire constituted the county of Humberside. On 23 August 1921, the British airship R38 crashed into the estuary near Hull, killing 44 of the 49 crew on board. The estuary's only modern crossing is the Humber Bridge, which was the longest single-span suspension bridge in the world from its construction in 1981 until 1998. It is now the ninth longest. Before the bridge was built, a series of paddle steamers operated from the Corporation Pier railway station at the Victoria Pier in Hull to the railway pier in New Holland. Steam ferries started in 1841, and in 1848 were purchased by the Manchester, Sheffield and Lincolnshire Railway. They, and their successors, ran the ferry until the bridge opened in 1981. Railway passenger and car traffic continued to use the pier until the end of ferry operations. 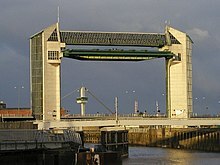 The line of the bridge is similar to an ancient ferry route from Hessle to Barton upon Humber, which is noted in the Domesday Book and in a charter of 1281. The ferry was recorded as still operating in 1856, into the railway era. The Humber was then one mile (1.6 km) across. The Humber Forts were built in the mouth of the river for the First World War. Planned in 1914, their construction started in 1915 and they were not completed until 1919. A coastal battery at Easington, Fort Goodwin or Kilnsea Battery, faced the Bull Sands Fort. They were also garrisoned during the Second World War, and were finally abandoned for military use in 1956. Fort Paull is further upstream, a Napoleonic-era emplacement replaced in the early 20th century by Stallingborough Battery opposite Sunk Island. Graham Boanas, a Hull man, is believed to be the first man to succeed in wading across the Humber since ancient Roman times. The feat, in August 2005, was attempted to raise cash and awareness for the medical research charity, DebRA. He started his trek on the north bank at Brough; four hours later, he emerged on the south bank at Whitton. He is 6 feet 9 inches (2.06 m) tall and took advantage of a very low tide. He replicated this achievement on the television programme Top Gear (Series 10 Episode 6) when he raced James May who drove an Alfa Romeo 159 around the inland part of the estuary without using the Humber Bridge. On Saturday 26 August 1911, Alice Maud Boyall became the first woman to swim the Humber. Boyall, then aged 19 and living in Hull, was the Yorkshire swimming champion. She crossed the Humber from Hull to New Holland Pier swimming the distance in 50 minutes, 6 minutes slower than the men's record. Since 2011 Warners Health have organised the 'Warners Health Humber Charity Business Swim'. Twelve swimmers from companies across the Yorkshire region train and swim in an ellipse from the south bank to the north bank of the river under the Humber Bridge over a total distance of approximately 1 1⁄2 miles (2.4 km). Most European hydronyms are Celtic in origin and numerous Celtic or Pre-Celtic derivations for Humber have been suggested. The Celtic root *com-*bero (coming together), gives the modern Welsh toponym cymer which is found typically at the confluence of rivers. A derivation of Humber from *cym(b)er is supported by the proven Celtic/Germanic sound changes of K to H such as Grimm's Law, and the geographic fact of the Humber being the confluence of a number of important rivers. The estuary appears in some Latin sources as Abus (A name used by Edmund Spenser in The Faerie Queene). This is possibly a Latinisation of the Celtic form Aber (Welsh for river mouth or estuary), but is erroneously given as a name for both the Humber and The Ouse as one continuous watercourse. Both Abus and Aber may record an older Indo-European word for water or river, (as in the ‘Five Rivers’ of the Punjab). An alternative derivation may be from the Latin verb abdo meaning black or dark river. The successive name Humbre/Humbri/Umbri may continue the meaning via the Latin verb umbro also meaning "to cover with shadows". By Medieval times, the river is recorded as Humbre (Anglo-Saxon) Hwmyr (Welsh) and Humbri (Vulgar Latin dative) / Umbri (Classical Latin dative). Since the name appears to reoccur in "Humber Brook" near "Humber Court" in Herefordshire or Worcestershire, it has been suggested that a root word *humbr- may have existed meaning "river", or something similar, in hypothetical Pre-Celtic language spoken before the Celtic Migration (compare Tardebigge). An element *ambri- 'channel, river' is also reconstructible for proto-Celtic and the Ancient Celtic prefix *su- 'good' routinely developed into Welsh element *hy-. The Humber features regularly in Geoffrey of Monmouth's 12th-century fictional chronicle Historia Regum Britanniae. According to Geoffrey, the Humber, invariably referred to by the Latin word for river, was named after "Humber the Hun", who drowned there while trying to invade in the earliest days of Britain's settlement. Andrew Marvell's poem "To His Coy Mistress" mentions "the tide of Humber". Many fish live in and also migrate through the Humber whilst returning from the sea to their spawning grounds in Yorkshire, Lincolnshire and Derbyshire. Salmon, sole, cod, eel, flounder, plaice, sprat, Lamprey and sand goby have all been caught in the estuary's reach. The Humber is also a good place for over-wintering birds and is a good breeding ground for bitterns, marsh harriers, little terns and avocets. In 2019, the Yorkshire Wildlife Trust and the University of Hull re-introduced the river oyster back into the Humber after a sixty year absence. Humber, the name of one of the sea areas of the British Shipping Forecast. ^ a b c d e Cave, Rachel (2002). "The Humber Catchment and its Coastal Area" (PDF). University of East Anglia. Archived from the original (PDF) on 2 February 2014. Retrieved 12 October 2013. ^ "Humber Estuary". Ramsar Sites Information Service. Retrieved 25 April 2018. ^ "Get-a-map online". Ordnance Survey. Archived from the original on 29 November 2013. Retrieved 6 March 2009. ^ "Department of transport figures for 2009. See table 2-1". Department of Transport. Archived from the original (Excel) on 4 May 2011. Retrieved 24 January 2013. ^ Cowper Reed, F R (1900). The geological history of the rivers of East Yorkshire. London: Clay & Sons. pp. 65–66. OCLC 11368522. ^ Smith, William, ed. (1854–1857). "Abus". Dictionary of Greek and Roman Geography. London: John Murray. ^ "Northumbria". Online Etymology Dictionary. Retrieved 12 August 2017. ^ Historic England. "Airship Memorial in Hull (1512866)". PastScape. Retrieved 14 January 2013. Entry includes considerable details about the ship, flight, and crash. ^ a b Historic England. "Hull Corporation Pier station (498352)". PastScape. Retrieved 14 January 2013. ^ Historic England. "New Holland Pier station (498365)". PastScape. Retrieved 14 January 2013. ^ Historic England. "Barton Ferry (79005)". PastScape. Retrieved 14 January 2013. ^ Historic England. "Bull Sand Fort (915963)". PastScape. Retrieved 14 January 2013. ^ Historic England. "Haile Sand Fort (1429147)". PastScape. Retrieved 14 January 2013. ^ Historic England. "Fort Godwin (929478)". PastScape. Retrieved 14 January 2013. ^ Historic England. "Stallingborough Battery (1429224)". PastScape. Retrieved 14 January 2013. ^ "Humber crossing after 1,000 years". BBC News Online. BBC. 22 August 2005. Retrieved 28 July 2008. ^ "Annual Humber Swim". Yorkshire Post & Leeds Intelligencer. 28 August 1911. p. 5. ^ "Business people to swim the Humber for charity challenge". Hull Daily Mail. 4 August 2013. Retrieved 26 June 2013. ^ Rivet; Smith (1979). The Place-Names of Roman Britain. London. ISBN 9780713420777. ^ Beda. "De Temporum Ratione". CAPUT LXV, number 269. Retrieved 24 January 2013. ^ "Salmon are spawning along the River Burn in North Yorkshire for the first time in 100 years". The Rivers Trust. 21 June 2017. Retrieved 23 March 2019. ^ Potts, Geoffrey; Swaby, Silja (1993). "Review of the status of estuarine fishes". English Nature Research Report. Plymouth: Marine Biological Association (34): 68–69. OCLC 182887652. ^ "Humber Management Scheme Fact sheet: Wintering and passage birds" (PDF). humbernature.co.uk. p. 2. Retrieved 23 March 2019. ^ "Humber Management Scheme Fact sheet: Breeding birds" (PDF). humbernature.co.uk. pp. 4–6. Retrieved 23 March 2019. ^ Mitchinson, James, ed. (19 March 2019). "River oysters come back out of their shell". The Yorkshire Post. p. 1. ISSN 0963-1496. D'Orley, Alun (1968). The Humber Ferries. Knaresborough: Nidd Valley Narrow Gauge Railways. Storey, Arthur (December 1971). Hull Trinity House: Pilotage and Navigational Aids of the River Humber, 1512–1908. Ridings Publishing Co. ISBN 978-0-901934-03-1. Wikimedia Commons has media related to Humber estuary. Wikisource has the text of the 1911 Encyclopædia Britannica article Humber. www.humberpacketboats.co.uk—Extensive private web site about history of river trading in Humber and tributaries.